I saw this play out in multiple countries — my home country of Turkey included — but last night, it became even more heartbreakingly apparent in the United States as well. For me, last night’s Ferguson “coverage” began when people started retweeting pictures of armored vehicles with heavily armored “robocops” on top of them, aiming their muzzle at the protesters, who seemed to number a few hundred. It was the fourth night after an unarmed black man, Michael Brown, was shot by a — still unnamed — police officer after a “jaywalking” incident. Witnesses say he died hands in the air, saying “don’t shoot”. The first night Mike Brown was shot, a friend asked on Twitter whether this would ever make the national news. 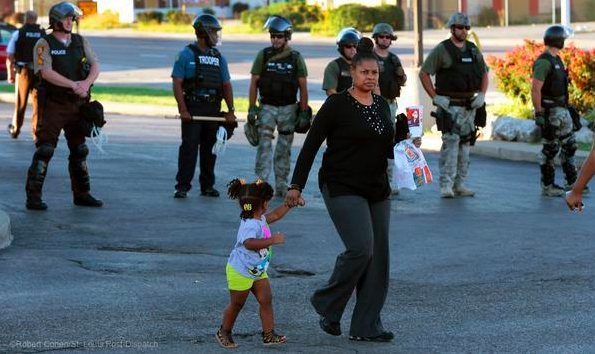 It deserved to be national news as multiple significant, ongoing crises intersect at Ferguson: the loss of jobs which hit these communities worst; the militarization of US police departments; race; chronic multi-generational poverty. But those very factors often make it less likely such places make the news, except as trouble spots. Places to be ignored. Avoided. “We” hear it only through official statements, often dismissing local concerns, painting them as looters, thugs, troublemakers. Yes Ferguson will make news, another friend tweeted, because… well, here you go: Twitter. It seems like a world ago in which such places, and such incidents, would be buried in silence, though, of course, residents knew of their own ignored plight. Now, we expect documentation, live-feeds, streaming video, real time Tweets. I watched this interaction online. When local the police department in Ferguson showed up at the first vigils for this young man with dogs, the outrage spilled over to people who may not have been following it the first day. When night after night, reports of tear gas came in, more national journalists went to the area, as well as more residents turning on their cameras, deliberately. More and more people started talking about this. Yesterday, national journalists were harassed, assaulted, arrested — without paperwork — while sitting quietly, recharging their phones at McDonald's — captured on video. Police positioned like snipers on top of armored, anti-mine vehicles kept their rifles — I have no idea what kind — aimed at protester within full view of national media, in broad daylight — pictured from multiple angles. This unfolded in real time on my social media feed which was pretty soon taken over by the topic — and yes, it’s a function of who I follow but I follow across the political spectrum, on purpose, and also globally. Egyptians and Turks were tweeting tear gas advice. Journalists with national profiles started going live on TV. And yes, there were people from the left and the right who expressed outrage. I write and talk often about protest over-policing in multiple countries, so the topic was not a new one to me but I saw many people who I know don’t necessarily follow this day-to-day (and don’t condemn — not everyone can, or should, follow every worthy issue) start talking about it. This morning, though, my Facebook feed is also very heavily dominated by discussion of Ferguson. Many of those posts seem to have been written last night, but I didn’t see them then. Overnight, “edgerank” –or whatever Facebook’s filtering algorithm is called now — seems to have bubbled them up, probably as people engaged them more. This isn’t about Facebook per se—maybe it will do a good job, maybe not—but the fact that algorithmic filtering, as a layer, controls what you see on the Internet. Net neutrality (or lack thereof) will be yet another layer determining this. This will come on top of existing inequalities in attention, coverage and control. Twitter was also affected by algorithmic filtering. 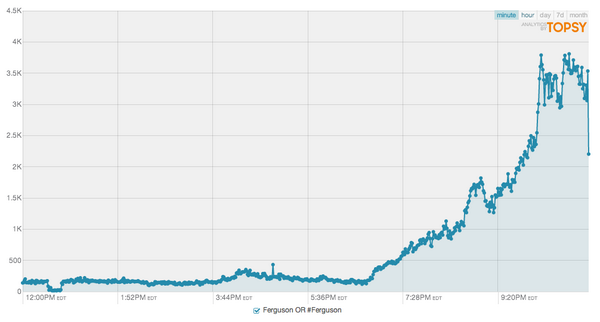 “Ferguson” did not trend in the US on Twitter but it did trend locally. [I’ve since learned from @gilgul that that it *briefly* trended but mostly trended at localities.] So, there were fewer chances for people not already following the news to see it on their “trending” bar. Why? Almost certainly because there was already national, simmering discussion for many days and Twitter’s trending algorithm (said to be based on a method called “term frequency inverse document frequency”) rewards spikes… So, as people in localities who had not been talking a lot about Ferguson started to mention it, it trended there though the national build-up in the last five days penalized Ferguson. Mass media, typically, does not do very well covering chronic problems of unprivileged populations, poor urban blacks bear the brunt of this, but they are not alone. Rural mostly white America, too, is almost always ignored except for the occasional “meth labs everywhere” story. But yesterday, many outlets were trying, except police didn’t let them. Chris Hayes says that police ordered satellite trucks off the area so that they could not go live from the area. Washington Post was only one outlet whose journalists were arrested — citizen journalists were targeted as well. But maybe in the future, they don’t have to bother to arrest journalists and force cameras off. In California, legislation is being considered for “kill switches” in phones — a feature I honestly cannot imagine a good use for this in the United States. The citizen journalists held on, even as choked from the gas, some traditional media started going live from the region, and today, it’s on the front page of many newspapers. Maybe, just maybe, there can be a national conversation on these topics long-ignored outside these communities. That’s not everything: it may be a first step, or it may get drowned out. But at least, we are here. But I’m not quite sure that without the neutral side of the Internet—the livestreams whose “packets” were fast as commercial, corporate and moneyed speech that travels on our networks, Twitter feeds which are not determined by an opaque corporate algorithms but my own choices,—we’d be having this conversation. So, I hope that in the coming days, there will be a lot written about race in America, about militarization of police departments, lack of living wage jobs in large geographic swaths of the country. But keep in mind, Ferguson is also a net neutrality issue. It’s also an algorithmic filtering issue. How the internet is run, governed and filtered is a human rights issue. Update 1: I have written a peer-reviewed update to this piece. Zeynep Tufekci. 2015. Algorithmic Harms beyond Facebook and Google: Emergent Challenges of Computational Agency. Colorado Technology Law Journal 13: 203.